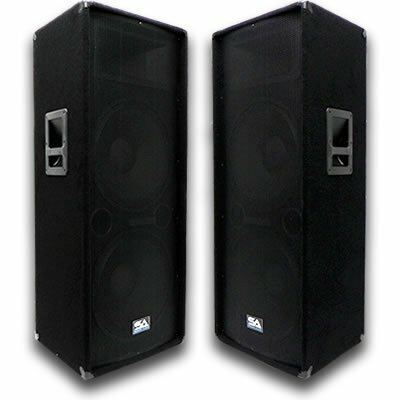 Pair of Professional Dual 15" Speaker MainsModel #: SA-155T (Sold as a Pair). Woofers: Each speaker cabinet has two 15" woofersEach woofer has a 50 ounce magnet. Each woofer has a 2" Kapton voice coil. Each Cabinet is 700 Watts RMS(1400 Watts RMS for the Pair). (RMS is what a speaker can handle with continuous play). Each Cabinet is 1400 Watts Peak(2800 Watts Peak for the Pair). (Peak is what a speaker can handle in short bursts). Each cabinet is wired to be a 4 ohm cabinet.. Frequency Response per cabinet is 45 - 20,000 Hz. Sensitivity is 96 db. Tweeter: 14" x 7"1.5" voice coil . Titanium driver with 10 ounce magnet. 1" throat. Crossover: Passive in-line12/18db per octave at 3000 Hz . High power w/ dual glass bulb tweeter protection. 5/8 front panel plywood. Precision cut, high end black carpet. Black metal corners . Recessed handles . Full Metal 14 gauge steel grill. Non-slip, skid resistant rubber feet. Multiple options input terminalDual 1/4" connections. Dual Speakon connections. Can be daisy chained with other speakers. Dual ports. 45" tall - 18" wide - 16" deep. Weight: 73 lbs per cabinet. These speakers are brand new. . One year warranty This listing is for a pair of these dual 15" speaker cabinets. You will receive two identical speaker cabinets, pictured and described above. Each speaker cabinet has the specs above. These are best for DJ's, PA use, keyboards, vocals, studio monitors, churches, weddings, and full bands.